The border wait times are now working on both iOS and Android, but it is still not possible to add/edit destinations on Apple devices with the latest iOS update. We are working to address this issue and will release a fix to ensure that you have the best experience when travelling with our app. You can find the latest Travel Advice and Advisories at https://travel.gc.ca/travelling/advisories. Access key information even while you are travelling. 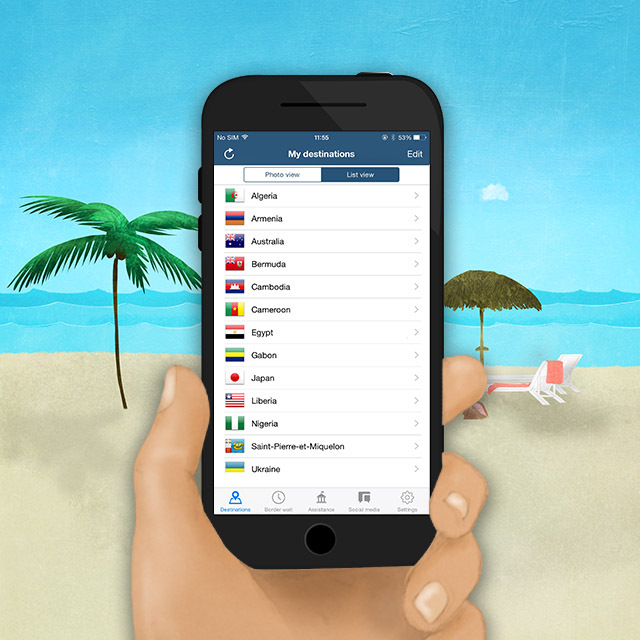 Find up-to-date travel advice and advisories on over 200 destinations worldwide. Find emergency contact information for embassies and consulates abroad and the 24-7 Emergency Watch and Response Centre in Ottawa. Find continuously updated wait times at key Canada-U.S. border crossings listed by distance from your location. Connect to Travel.gc.ca’s social media accounts, where you can ask questions, share travel advice and learn even more about travelling safely and smarter abroad. Sign up for the Government of Canada’s Registration of Canadians Abroad service and stay connected to Canada in case of an emergency at home or abroad. Download our new app and Travel Smart!